The Réseau: playing a leadership role so that Francophones may live healty lives in French! The Réseau is a Francophone organization that engages the Francophone community in all its diversity and the healthcare community to improve the active offer and the access to a continuum of quality health care services in French. For more than 15 years, we have played a leadership role in ensuring that the region’s 260,000 Francophones have access to quality French-language health services. Our organization is made up of more than 800 individual members, 74 corporate members, a mainly community-based Board of Directors, and a team charged with the advancement of French-language health-care service planning files. 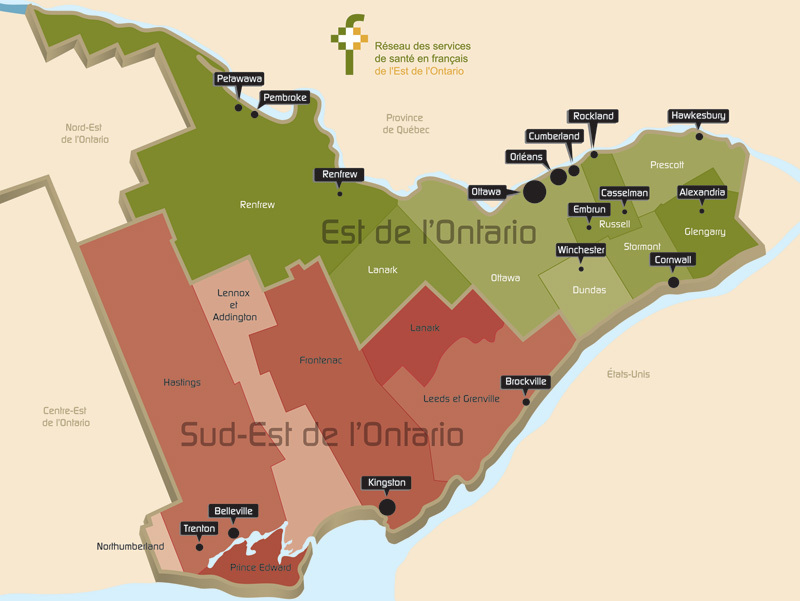 In 2010, the province of Ontario recognized the Réseau as the French Language Health Planning Entity for Eastern and South Eastern Ontario. Under this mandate, we advise the Champlain LHIN and the South East LHIN on all issues affecting Francophone health. The Réseau is also one of Société Santé en français’ 16 member Francophone health networks. We work with the SSF to improve the health of Francophones living in minority communities throughout Canada. Become a member of the Réseau!